A few weeks ago I took a bus from Philadelphia to New York, and as we zipped through the New Jersey Meadowlands and the Manhattan skyline came into view, I realized that I was following my personal map of crime. Crime writing, that is. The bus had just passed Newark’s Ironbound section, which reminded me of the mob hit man I had once met who had been involved in a beef between the Jersey faction of the Lucchese Family and the Philadelphia Family over Joker Poker video machines. It was a unique story because it wasn’t family against family, but the younger generation against the older. My partners and I pitched it as a documentary, but after some initial interest, no one bit. At the time The Sopranos was eating up the whole Mafia pie. Newark is near the home base of Joshua Armstrong and the Seekers, a team of bounty hunters guided by their spiritual beliefs. Their success rate is better than the US Marshals’, but they use force only when it’s absolutely necessary. Joshua and I collaborated on the non-fiction book, THE SEEKERS: A BOUNTY HUNTER’S STORY. 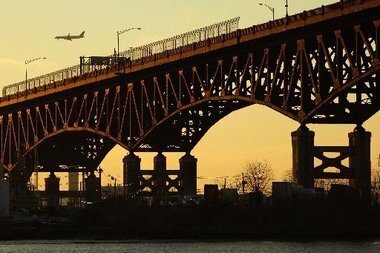 The Pulaski Skyway, a vintage black iron snake that crosses the Passaic and Hackensack Rivers, reminded me of the junkyard in its shadow where cops dug hole after hole looking for Teamster boss Jimmy Hoffa’s remains. It’s one of dozens of Hoffa burial sites around the country that didn’t pan out. I once wrote a piece on Hoffa’s disappearance and listed all the locations where tipsters had told investigators they’d find his body. They still haven’t found it and probably won’t. The prevailing theory these days is that he was cremated soon after he was abducted. As the wiseguys say, no body, no crime. The new World Trade Center tower is taking shape in lower Manhattan, a soaring monolith on the site where the twin towers had stood. After 9/11, I had written an article about the last two people rescued from the wreckage, both courageous Port Authority Police officers, John McLoughlin and Will Jimeno. On Route 3, on the approach to the Lincoln Tunnel, there’s a Motel 8 wedged on a strip of land next to a wall of jagged rust-colored rocks. It used to be the York Motel where mass-murderer Richard “The Iceman” Kuklinski had murdered one of his underlings with a cyanide-laced hamburger. When I interviewed Kuklinski in prison in 1992, he explained to me that he had to mix the poison with ketchup to hide the taste. He recommended mixing cyanide in a tasty sauce of some kind, something “gooky,” otherwise the victim might not eat it. This was one of many tips he gave me about the killing trade. On the winding road to the tunnel, I looked to my left and saw Manhattan spread out on the other side of the Hudson, like a reclining giant about to sit up. I looked toward Greenwich Village where the boss of the Genovese Family, the late Vinny “Chin” Gigante, would amble along the sidewalk in front of his apartment building in his slippers and bathroom, mumbling and talking to the parking meters, maintaining the mental disability act he’d started in the 1960s to avoid prosecution. The Feds eventually proved that it was a ruse and put him away. Gigante was the inspiration for one of my favorite villains, “Sal Immordino,” in my thrillers, BAD LUCK and BAD MOON. Using the slanted top of the Citigroup Center as my guide, I estimated the location of East 50th Street next to St. Patrick’s Cathedral where a crucial scene in the TV movie adaptation of my novel, BAD APPLE, was filmed. In the scene, the hero, FBI Special Agent “Mike Tozzi” (played by Chris Noth) is kidnapped and thrown into a van with the girl of his dreams (played by Dagmara Dominczyk). I was on the set that day and was tickled pink to see dozens of people working on a film based on an idea that came out of my little bitty head. Sweet. A few blocks north and west on 57th Street, I met disgraced FBI agent John Connolly who had handled Boston’s two most notorious gangsters, James “Whitey” Bulger and Stevie “the Rifleman” Flemmi. While protecting them as “top echelon informants,” Connolly also ran interference for them as long as they fed him inside information about the Mafia. It was a win-win for everyone involved–Connolly made high-profile mob busts that furthered his career, and Bulger and Flemmi had the best friend a gangster could ever want. When I met him, Connolly was looking for a co-writer for a proposed book on his mob-busting adventures, but there was something fishy about him. Part of it was his flashy John Gotti style. I followed my instincts and politely declined to be considered for the project, and it turned out that my gut was right. Connolly was later convicted of second-degree murder for providing information that led to a gangland slaying in Miami ordered by Bulger and Flemmi. He’s now serving a 40-year sentence. Looking uptown, I was reminded of the long weekend I spent with Harlem drug lord, Leroy “Nicky” Barnes, perhaps the most interesting criminal I’ve ever interviewed. He had served his time, gone into witness protection, and was living a life very different from the supercharged high life he had once known. But the leopard hadn’t lost his spots even if they weren’t obvious anymore. I’ve met a lot of convicted felons, several of them murderers, but none had Barnes’s razor-sharp criminal instincts. Unfortunately I didn’t get the opportunity to write his book, but I don’t consider the time I spent with him a waste. It was a graduate-school level education. My bus slipped into the shade of the Lincoln Tunnel, and I was quickly mesmerized by the dancing, streaming reflections of red tail lights on the tiled walls. Tail Light River is a book title I’ve been holding onto for decades. I don’t know what the book would be about–I just love the image. But who knows? Maybe one of these days I’ll meet someone whose story will go with the title, and he or she might be another pushpin in my map of crime. did you spend time in NH as a kid with Scoot M ? Yes. Scott was my cousin. Did you live two doors down from my Meme on Elkins St.?